We are a mixture of residents and international travellers passionate about the Patagonia region, sustainable living, and conscious traveling, ready to help you enjoy the splendours of Bariloche while enjoying a comfortable and friendly stay in the city center! Join us for affordable vegan lunches and dinners offered daily, prepared by one of our awesome international cooks! 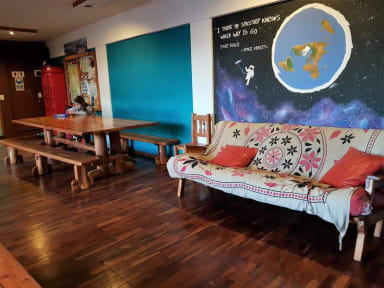 We pride ourselves on providing a home for you to enjoy while travelling, with comfy common room couches in the naturally-lit lounge, WiFi, guidebooks, travel and adventure advice, tour and activity booking, and much more! We are located in downtown of Bariloche 200 meters from the main street, 3.4 kilometres of the bus terminal and 15 kilometres of the airport. 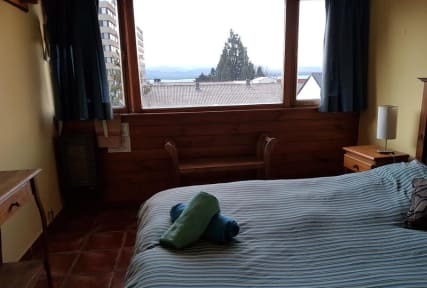 The rooms maintain a good ratio of space and number of beds, some of them has mountains and Nahuel Huapi lake view, they are well ventilated an warm. We offer fresh bed linens and free breakfast for all travellers staying with us. Thank you for your reservation with us. We are looking forward to meeting you! Reception opens from 8am to 12am. Additional Services: We offer laundry service (wash, dry, fold) for AR$ 100 for a full bag of laundry (price subject to change). If you would like any special items washed like down jackets, sleeping bags, or wool clothing, we can help clean those too. Towels are available for hire for an additional charge for dorm rooms, and are included in private rooms. Taxi / Remise service is available from the front desk at any time. Meals: Homemade vegan breakfasts full of energy are included with your stay, served from 8:00 am to 10:00 am. If you would like dairy milk, you must bring your own, as we serve only homemade coconut milk with your tea and coffee. You may request an early breakfast if you are heading out early. Each night, we serve a homemade international vegetarian or vegan dinner, for an additional cost of only AR$ 150 pesos. Some example dishes include vegetable oven pies, hearty stir frys, harvest salads, homemade gnocchi nights, vege tacos, and a weekly pizza night. The menu is always changing and evolving with our chefs and the tastes of the guests. We focus on local producers and do our best to showcase the talent of our resident chefs while highlighting local ingredients. You will surely leave the table satisfied, having tried some delicious food while enjoying the company of staff and guests! We have many years of experience cooking healthy and filling vege meals for large groups, so we hope you join as at least 1 night during your stay :) Please be aware that the kitchen is closed from 5pm to 8:30pm to allow our staff time and space to prepare group meals. Activities and Excursions: Let us help you plan any activities you have in mind during your stay in Bariloche and the surrounding area. We have all the knowledge and abilities to help make the process as smooth as possible for bookings of treks, land / lake tours, bike trips, and winter / spring snowboard and ski passes and rental. Additionally, we can advise and help book your travel over the border to Chile, south to other Patagonian destinations, or north to the rest of South America. If you have any activities or trips in mind before arriving, please email us so we can help you as soon as possible.